Have you heard of Eskimo Bars? Apparently a while ago on the Food Network show “Best Thing I Ever Ate” (do they even air that anymore? ), Giada De Laurentiis expounded prolifically on her love for these crazy delicious bars she had in Jackson Hole, Wyoming. Basically, you take a decadent baked brownie layer. Top it with a thick, creamy layer of good quality vanilla ice cream. 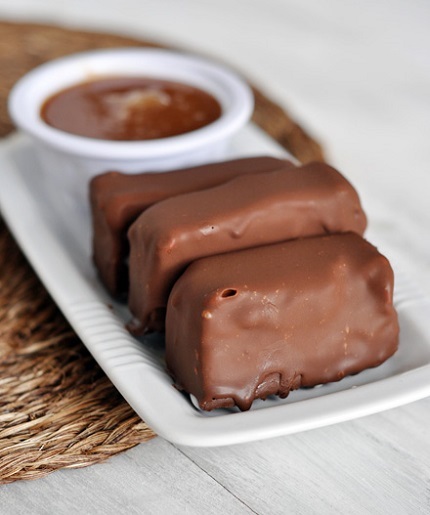 Cut into rectangles and dip in a homemade magic shell mixture that hardens immediately and leaves a crisp, thin chocolate coating on the bars. 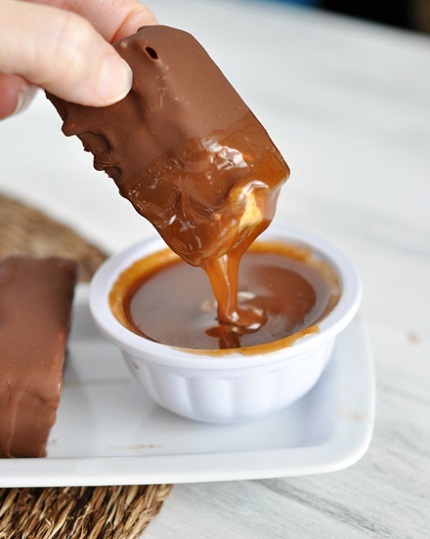 Now here’s the kicker: you take the culmination of brownie, ice cream, chocolate bliss between your little fingers and dip it into luscious warm caramel sauce. It is messy. Very messy. But the absolute explosion of rich, decadent brownie sundae happening in your mouth will alleviate any worries about cleanup. Can you even stand it? Now, listen. I know some of you (like me) hate the thought of dipping desserts. I get it. But I promise that the anxiety you are feeling is unwarranted! 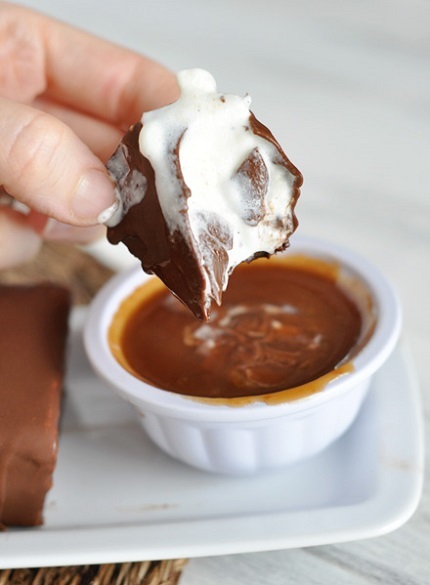 The chocolate shell mixture is so easy to work with that the dipping part is perhaps the easiest part of the recipe (but not the cleanest, not the cleanest at all). Don’t be like me and let years go by before you make these. Think of the rock star status you will earn when you serve these to your family and/or friends. And it will be well deserved. Keep in mind that you can make these start-to-finish several days or even weeks in advance and the process can be spread over several days. While you contemplate those awesome facts, I will leave you alone as I go delve into the depths of my terribly narrow freezer and dig out the last three of these I hid away from humanity. Dark corner away from children, here I come. Oh my gosh. They are so good. This recipe looks involved but it's actually quite easy. The trick is allowing time to freeze each step so that the ice cream doesn't melt while you are assembling and dipping. They can be made start to finish and stored in the freezer for up to a week (probably longer, actually!). Honestly, they are so worth the multiple steps: did I mention the comment "best dessert ever?" Bake until a toothpick inserted into the center emerges slightly moist with batter, 20 to 25 minutes. Let cool completely on a rack and then chill in the refrigerator or freezer until thoroughly cold. This will help the brownies hold up well to the ice cream layer that's coming. For the magic shell, in a microwave-safe bowl, combine the coconut oil and chocolate chips. It helps if the bowl is taller than wide so that when you dip the bars, the chocolate mixture is deep and not super shallow. Microwave for one minute intervals at 50% power until the chocolate is melted. Stir the mixture until it is smooth. It will be fairly runny. Remove the pan of brownies from the freezer. Gently lift the foil handles and remove the ice cream layered brownies from the pan. Cut the brownies in half. Then, working with one half at a time (you might want to return the other half to the freezer if your kitchen is overly warm), cut rectangle into long, thin bars, about 1-inch by 4-inches. You should end up with 8 or so bars per half. Repeat with the remaining half. It is best to put all the cut bars onto a tray or plate and keep them in the refrigerator while dipping so they stay as cold as possible.